This image shows how the Sun would look at the extreme ultraviolet wavelength end of the spectrum. 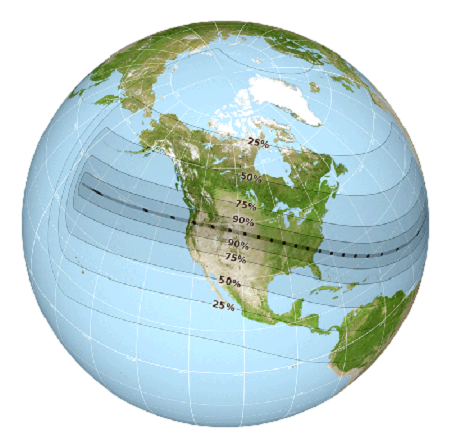 This map shows the globe view of the path of totality for the solar eclipse happening on August 21, 2017. This August communities across the United States will witness a total solar eclipse for the first time almost 100 years. This event is both a visual spectacle for sky watchers and a significant scientific event. A conversation with astronomer Rachel Smith about the coming eclipse of the sun and what scientist hope to learn from the event. 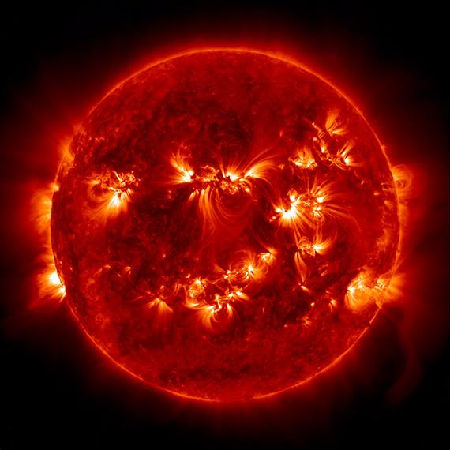 Researchers can use solar telescopes to study the outer layer of the sun that is harder to see when the sun is not eclipsed, and solar astronomers will get new insight into space weather patterns. Host Frank Stasio talks about the science of the sun with astronomer Rachel Smith. Smith heads the Astronomy & Astrophysics Research Lab at the North Carolina Museum of Natural Sciences. She is also a professor of physics and astronomy at Appalachian State University. Smith will participate in the museum’s International SUN-day event this Sunday, June 18 from 12:30 p.m. to 4 p.m.